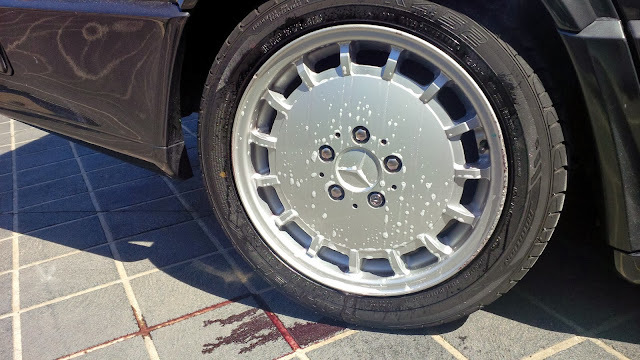 Mercedes-Benz 190E 2.5-16: Concours Detailing Day 6 of 5 - OVERTIME!! Concours Detailing Day 6 of 5 - OVERTIME!! Holy crap! Saturday, the day before Concours, I've gone into overdrive in overtime! I didn't really have too much time to take many photos, so I'll just list what I did today. If I have a pic, I'll post it up. 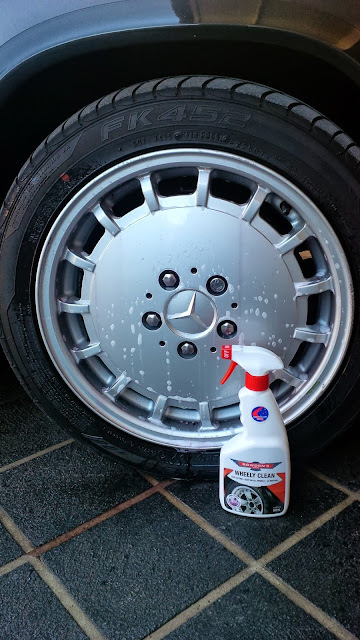 I started with a wheel clean. 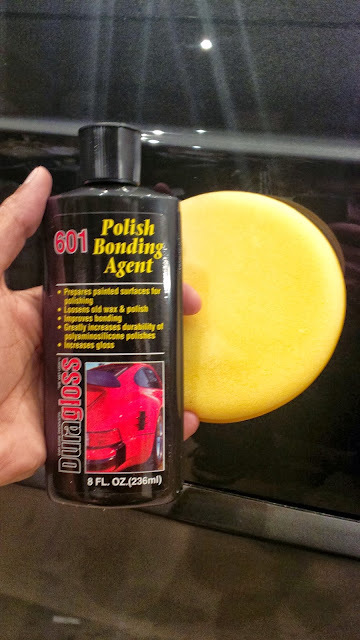 I had some credit at the local auto shop so I used it to buy a bottle of Bowden's Own Wheely Clean. This stuff is hella cool. It'll chew on iron particles on the wheels that have become stuck to them and it turns purple in the process. Then a foam bath to get rid of all the polishing duct that had accumulated. Here's some beading/sheeting of water after machine polishing. Compare that to last week's video where I tested the same only after a decon wash and before clay. 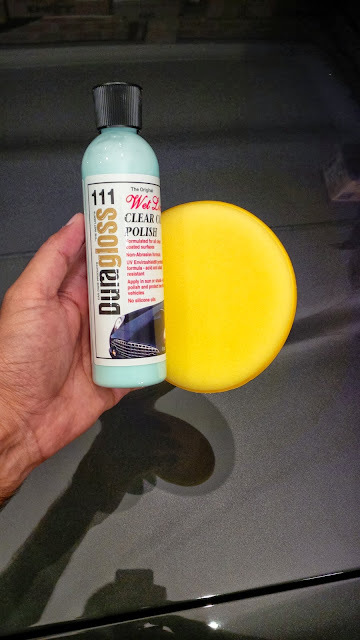 Once dried, I did a complete IPA (isopropyl alcohol) clean of the entire car. That got rid of anything remaining on the paint work. Next, I put on a thin layer of Duragloss 601 Bonding Agent followed by Duragloss 111 Clear Coat Polish. After buffing everything off, I moved on to the interior. 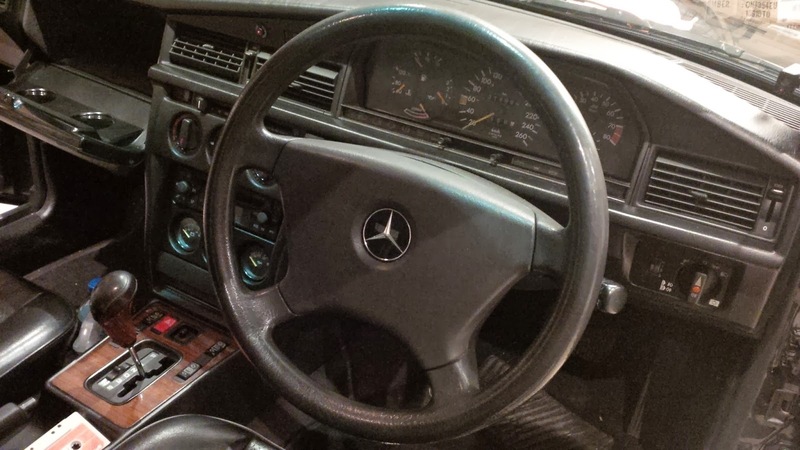 First, I cleaned the original steering wheel and fitted that back into the car. 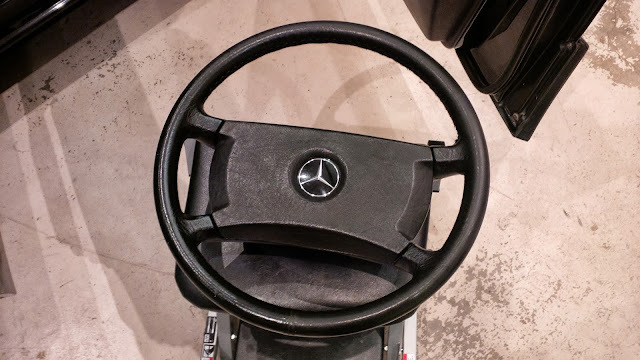 Out with the temporary wheel. In with the original. I cleaned it with Autoglym Leather Cleaner and protected it with Autoglym Leather Care Balm. 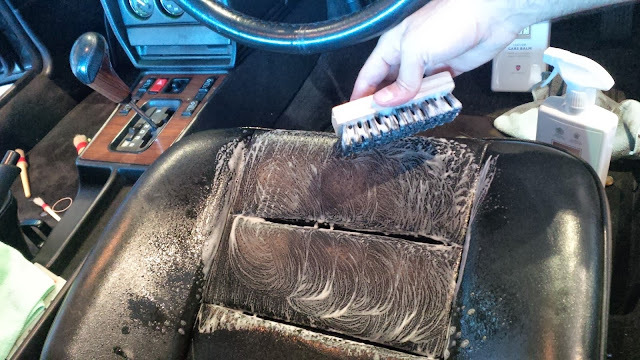 I used the same products for all the leather inside. Man, let me tell you, that was a lot of work! The number of microfiber clothes I went through was astonishing! That's all the photos I have. By this time, I was so far behind on today's schedule that I abandoned the camera and focused on the tasks at hand. Next up was a vacuum and light brush of everything, loosening any dirt or dust. I wiped all interior plastics with diluted APC (all purpose cleaner) then protected it with 303 Aerospace Protectant, as was all plastics around the outside. All glass was then cleaned inside and out. That was a big job since I wanted it to be absolutely crystal clear. I think I went overboard because I spent so much time on it. Time spent today was 13.5 hours!! I'm so bloody exhausted! Hasan Sheriff. Powered by Blogger.